Wow, we can’t believe another year has gone by so quickly at The Nathan Chris Baker Foundation and we continue to be overwhelmed as we think of the support that we continue to receive from everyone. Last year we posted our “Year In Review” for the community to see exactly what we were up to all year. We had great feedback after sharing so we decided to make this an annual post! As a board, we started off our 3rd year by meeting as a team in February 2015, where we brainstormed and planned for the year ahead! We spent hours chatting, as a team, about the year ahead in which we were planning our 2nd Annual Golf Tournament and our 4th Annual Fun Day. We discussed applications for school playgrounds, a baseball field, and brainstormed merchandise, and more fundraising! Our NCB team is an amazing group of people that have become great friends. These meetings are long and there is a lot to talk about but there isn’t a better way to spend this time than with a team who all have the same goal… making The Nathan Chris Baker Foundation GREAT! Since 2012, NCBF has done some great things and made a significant impact on the community and the lives of others. We have donated over $140,000 back to the community in an effort to assist with large projects and small efforts to improve the lives of others. In 2014, we created our Days of Greatness program and in 2015 it continued to thrive! This program has been a huge success at lifting the spirits of families and individuals who are going through some tough times dealing with illness and financial struggles. Our Days of Greatness team was able to send many care packages throughout the year to families in need, send 2 families out for a Day of Greatness, and gave a 3rd family a Christmas to remember. It’s always fulfilling to see the smiles in the pictures and stories that these families share. We sent one young boy fighting cancer, and his family, out on a chartered fishing trip to enjoy a day on the bay catching rock fish. The team sent another family fighting illness on an overnight stay at Hershey Park to enjoy a day together without worry. Lastly, we helped a family in Frederick, Maryland have a great Christmas by bringing Christmas to them! We came out with our NCB elves and decorated their house with lights and garland to help light the season. We also supplied their Christmas in the way of presents under the tree! We were thrilled to take this financial stress and time off the family so that they could spend every minute together cherishing the season. Additionally, this year we got to give back in the community by purchasing and delivering secret Santa baskets to families that just needed a little boost of surprise GREATNESS. We were able to drop baskets to 10 families throughout the Carroll County area during the month of December. Earlier this year, we released our partnership with Carroll County Department of Recreation and Parks to commit $30,000 to building a youth baseball field for kids 8 to 12 years old across from Winfield Elementary. To date, we have donated $15,000 to this project and look forward to working with the Department of Recreation and Parks on this field! NCBF donated an additional $2,000 to Runnymede Elementary School bringing our total donation to $12,0000 since December 2014. These funds will assist in building a new playground at the school. Tate the GREAT joined NCBF’s team in 2015. Tate is NCBF’s mascot and was named through suggestions of the public. Nathan was often referred to as “Nater Tater” so “Tate the Great” was a perfect fit. Tate has been a fun addition to our team and has brought many smiles and lots of laughter to each event since! This year we finished an 8 month fundraising campaign with the collection of Glory Days receipts by receiving a check for $580. Thanks so much to everyone who helped collect and mail in your receipts, the money was used to fund an additional “Day of Greatness”. Every time we opened the PO Box to see another full box of receipts we were amazed! Thank you for sharing greatness! In March, we entered the Carroll Arts Peep Show as a way to spread awareness to the foundation. We collected peep donations from the community to create our “Sliding into GREATness” design and we won an award for Best Non Profit Entry. In May, we had our 2nd Annual Golf Outing at Turf Valley Resort in Ellicott City. The tournament was a huge success hosting 132 golfers on one of Turf Valley’s beautiful courses. The tournament is NCBF’s largest fundraiser of the year and contributes greatly to our goal of assisting others in the community. We will be hosting our 3rd Annual Golf Tournament on Friday, June 24, 2016! In July, we had a team create a parade float and we walked in the Winfield parade as a way to be involved in the community! We passed out candy, informational post cards, and got to see smiles on so many faces as Tate the Great dance and waved. In August, the foundation had a beautiful night out at Camden Yards with our supporters! The night was a fun night, raised awareness, and raised money for more great things! In September 2015, we held our 4th annual “Nathan Chris Baker Fun Day” at Hoppers Kids Zone with incredible weather and a GREAT turnout of over 1000 people. We added a few new carnival games and a gaming truck which were big hits for both kids and adults! This event remains special to our team since it started just two months after the loss of Nate. We cannot thank everyone enough for your continued support for this event. We couldn’t do it without all of the attendees, sponsors, and donations that came through. It sure was a GREAT day to get outdoors and enjoy some time with your family and enjoying this great community. Throughout 2015, NCBF organized several teams that participated in many running events to inspire personal greatness and raise awareness for the foundation in both Maryland and Virginia. These teams have adopted the name “Team Nate” over the years. 2015 races included the Historic Half marathon and 5K and the Tough Mudder in Virginia, Police Pace 5K in Columbia Maryland, Baltimore Running Festival, and the Ragnar Relay race from Western Maryland to Washington DC. 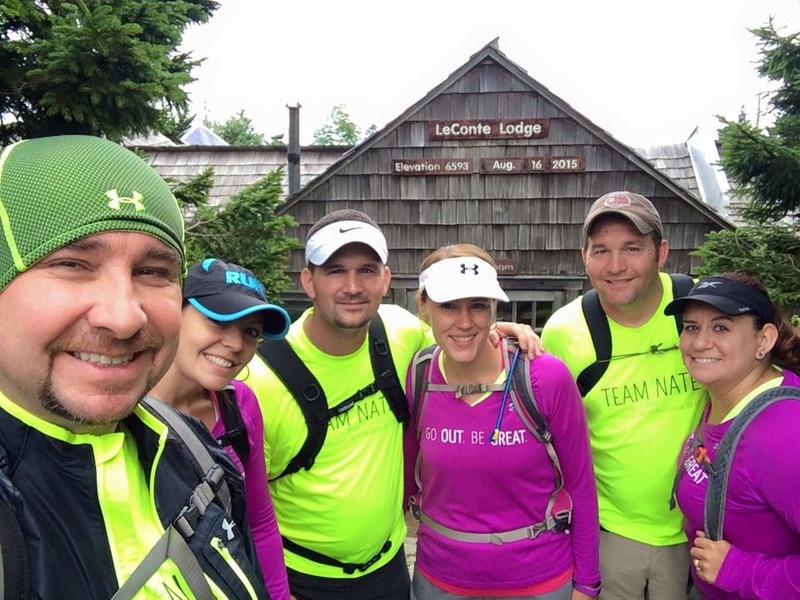 These Team Nate races have been rewarding both personally and for the foundation. As a team, we have decided to not continue to organize team races but instead move forward with hosting our very own race! On May 15, 2016 we will share with you our vision of The GREAT 5k and 1 mile fun run and we can’t wait. Hope to see you all there and see your greatness on the course! Looking back on 2015 – we are so grateful to so many people and businesses in the Carroll and Howard County areas for your unwavering support throughout 2015. It has allowed us to help so many individuals and families in need to Go Out and Be Great. We thank you from the bottom or our hearts for your time, donations, prayers, and overwhelming support at all our events. We look forward to an exciting year of helping many individuals, families, and the community in 2016. 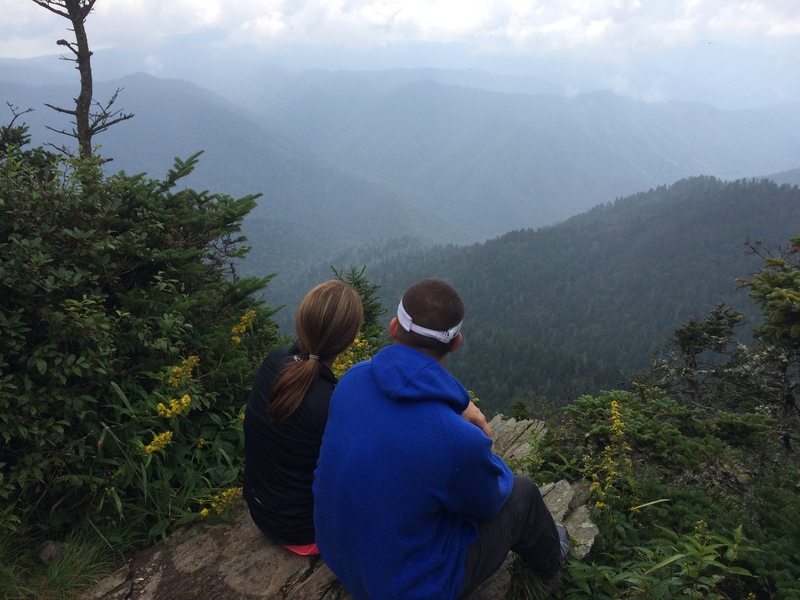 Last weekend, 6 of us set out on a crazy adventure to hike Mt LeConte in the Smoky Mountain National Park. We hiked around 25 miles in about 36 hours and spent the night in a rustic lodge at the top. No road access, no electricity, no running water, just you on top of the world! The hike up was beautiful and stunning. Gorgeous views you could stare at for days. The hike was about 5.5 miles to the lodge and about at 2500 elevation gain. The hike had a few narrow cliffs where cables had been installed to hold as you cross. It was a stunning experience to be holding on by your right hand and just staring off into beauty to the left. After we reached the lodge and checked in we decided to explore a bit. We hiked up to the summit, Cliff Tops, to explore. To sit at the summit and look out over the mountains is such a literal breath of fresh air. Cut off from society, you are able to just breathe in the beauty that we so often take for granted. It was actually drizzling a little bit at that time but I didn’t care one bit. I was completely awe struck by the moment and the beauty. For me, I was able to breathe God in,to see his beauty, and feel inspired to do more. There were moments of total peace and comfort. I stared into the horizon and thought about Nate, my family, and also how grateful I am that I’m not afraid to really live and love this life. As I gazed at the beauty that surrounded me the entire day I realized that this life is pretty amazing no matter our circumstances. After losing Nate, one of my biggest fears for myself and my family is that we’d be scared. That life, itself, would frighten us and leave us paralyzed by the fears. I was scared that I wouldn’t really want to “live” life anymore for fear that something bad might happen to us. We have not let fear stop us. We keep moving. We keep move forward. We tackle new days and we tackle new challenges. Sitting at the summit of this hike really gave me some clarity to that. I am so grateful that God continues to give us strength not to just merely exist in this world but to really LIVE it, LOVE it, and EXPERIENCE it. That doesn’t mean we don’t miss Nate every second of every day. It means we make a choice each day to embrace life. In the days before the hike we decided we would all wear our Team Nate and Go Out Be Great shirts. This was not a team organized event but something we knew was pushing each of us beyond our limits and inspiring greatness in each of us.It’s amazing when you put 6 people in the same shirts the questions it sparked. We crossed other hikers that would encourage us by chanting as we passed “Go Out Be Great”, people who would ask “Whose Nate?”, we ran into so many people that asked us about Team Nate and the foundation. The hike proved inspiring in many ways! Not only did we reach the summit, we tackled fears, and we challenged ourselves, but we were also able to share Nate and the foundation to so many people! “If you build it, they will come.” NCBF wants to build it and we hope that youth from around the area can enjoy it for years to come. NCBF recently met with the Carroll County Department of Recreation and Parks to discuss a future project that we can be involved with. Our meeting with the director of Carroll County Department of Recreation and Parks went well and our board has voted to approve a partnership that will allow NCBF to fully fund a future baseball field in the Winfield area of Carroll County. This project will encompass a youth baseball field and possibly a soccer field. The park will be located on a piece of land owned by Carroll County Department of Recreation and Parks and maintained by the Winfield Recreation Council. NCBF will fully fund the park/field at a cost estimated to be at about $30,000. NCBF has been involved in some great projects since 2012 – all of which we are extremely proud of and excited to see used by so many young kids. In 2014 – we talked about wanting to branch out from playgrounds and have a location that we could help build from the ground up. We contacted the Department of Parks and Recreation and were thrilled to learn that they had a location that they were wanting to develop – they just needed some help in funding it. Needless to say – we are so thrilled about this project! We want to build it. This is NCBF’s field of dreams! Join us in making this field of dreams come true. Please consider making a donation today or come out to one of our events to support NCBF. Today, is May 28, 2015. Tomorrow, is our 2nd Annual Nathan Chris Baker Golf Tournament. We, as a team, are excited and anxious to get tomorrow rolling! We are ready for another GREAT day! The week before an event is always filled with errands, last minute never ending to-do lists, and yes, a bit of stress for all of us planning. As I’ve journeyed this week I have multi-tasked like an event planning professional conquering one to do after the next. I felt strong and ready to brave each days tasks. But in a moment, I am reminded of brokenness. My heart hurts. With the stress of the week the days have passed quickly. What I was expecting today was to wake up ready to tackle the day before the golf tournament with eyes open and ready. Instead I woke up emotional carrying a sick feeling in the pit of my stomach and tears filling my eyes at every turn. I was paralyzed by fear that today meant the first step in a hard year ahead. I knew this day was coming. I’ve known it since August 2014 when Kaylee entered her first year of preschool at Wesley Freedom Early Years Learning Center. But the year went by so fast. She has loved every second of preschool. She is social, like Nate. She loves life, like Nate. And she loves school and being challenged, much like Nate as well. Preschool days are some of the last memories I have of Nate. Kaylee was born the year Nate was in 3 year old preschool. Now she is in his same classroom. All 3 of my children have attended the same preschool so, let’s be honest, sending my last baby through was going to be emotional anyway but having the last memories of Nate at preschool makes seeing Kaylee hit milestones even harder. Last week, we had her preschool picnic to celebrate the end of 3 year old preschool. 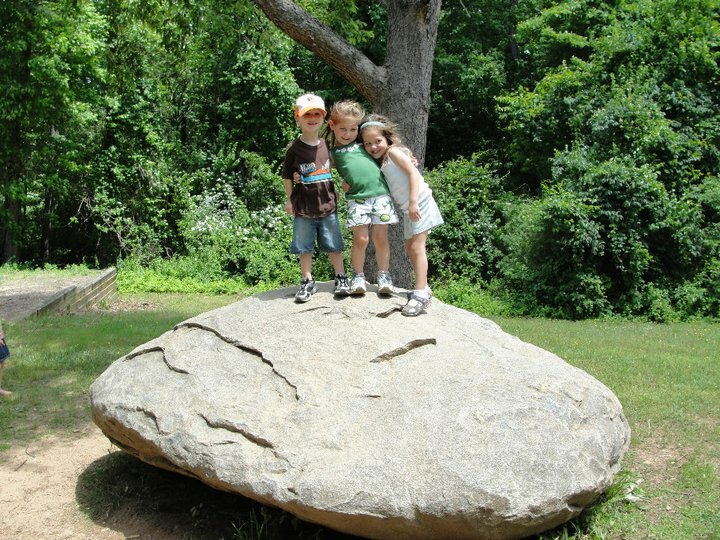 There was a rock Nate played on at that park at Drew’s picnic first and then his own 2 years later that I couldn’t go near. Sometimes I can tackle many things. Some days I can’t. Today, is the last day I dropped Kaylee off and picked her up at 3 year old preschool with the same teacher(s) that Drew & Nate both had. They have a piece of my heart. They have taken care of 3 of my babies. They cried as they welcomed Kaylee into class on day 1 promising to take care of her and comforting me through my pain. They thanked me for bringing her to them. They were worried it would be to painful for me to be back but I assured them that I trusted no one else to care for Kaylee and I knew they would take care of her the same way they did for Drew and Nate. When I woke up this morning I truly wasn’t expecting the overwhelming emotion that I felt. I knew it was deep down inside …. I just wasn’t quite prepared for it to surface. Kaylee is growing up. Next year, means 4 year old preschool. Which means graduation. Which means she will turn 5 this school year, which also means Kindergarten is on the horizon. While, yes, these would all be hard things to swallow with your last baby growing up. This year, is especially hard for me with Kaylee. She will be the age that Nate was. She will pass his earthly age. I am not ready. That feels like moving on without Nate. That leaves me feeling sad and missing my boy so much. It leaves me wishing he were here with us celebrating another summer on its way. When I hit those emotional roller coasters I turn to music to hear God. And today was no different. Something about a song can open my heart to allow Him right inside. He fills me with strength, faith, and love. He fuels me to make it another day with Him by my side. Kari Jobe said it well for me today in her song “Steady My Heart”. I needed steadied. I needed calmed. I needed reminded to surrender the pain again. Wish it could be easy. Why is life so messy? Sometimes it just hurts so much. I know that You’ve got me right inside the palm of your hand. Whats good and what gets broken happens just the way that You plan. And I find refuge in your arms! The pain is real. Our lives are real. Our lives are moving forward because that’s the reality of this world but it feels at times like we are leaving Nate behind as the days, months, and years now begin to pass. So many days, I feel him with us, right in the midst of all of it with us. But when Kaylee becomes older than Nate… the thought alone leaves me speechless. It’s been a fear of mine for quite sometime now and today, the milestone, of moving on from 3 year old preschool makes that fear one step closer to reality. I don’t want her to grow up. And I don’t want her to be 5. In my brokenness, which is hard for me to admit, I have to remind myself to surrender it all to God. He has walked me to this point and he will keep walking me through the rest. Oh my goodness! The Nathan Chris Baker Foundation is off to a great year! It’s May… closing in on the first half of the year (wow, how does time pass so quickly?)! We’ve been busy behind the scenes on some new ideas that we can not wait to share! Literally, I am bursting at the seams to share everything with all of you that support us and follow our NCBF dreams! I’m excited to jump right to sharing the first piece of news…. please stay tuned over the next few weeks because there is more to come! So…. you know those really crazy dance offs at Fun Day? The ones where the mascots from all the schools gather around and dance and we all cheer? 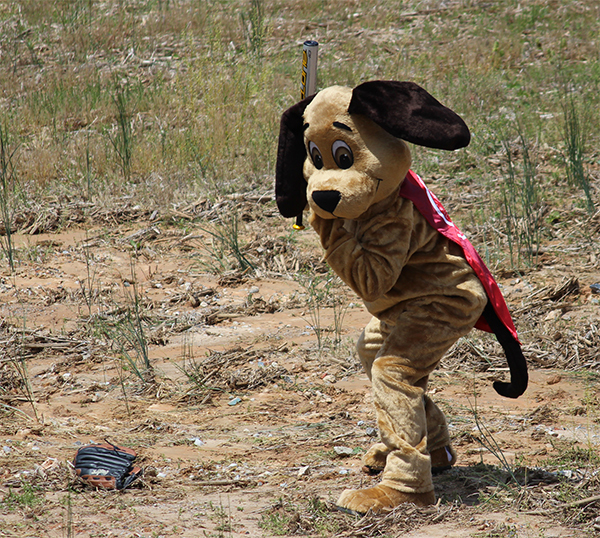 Well last year after fun day it dawned on us… we need our own mascot! I mean, seriously, why didn’t we think of this sooner? So the thought process began… what would our mascot be? We pretty quickly decided on a dog. I know you are probably thinking…. Nate must of loved dogs and that’s why we chose a dog. If I’m being totally honest, Nate actually loved our dog but really wasn’t always crazy about other dogs! He wasn’t scared or bothered by them, I just think to him they were in his way and he had bigger things on his agenda! So, you all know we have this program called Days Of Greatness here at NCBF where we give a day of great fun to a family in need. So, an inside confession has to be made in order for this to all make sense… As a board and a Days Of Greatness team, we pretty quickly began to abbreviate Days Of Greatness down to D.O.G. when we were in discussions or emailing. It became normal conversation to us even though someone else may not understand why we were going on and on and about “DOG days”. So, when we decided that NCBF needed a mascot… a DOG was an easy choice! Not only is it fun, friendly, but also a symbol of our Days Of Greatness program which we feel very passionate about. After a search of mascots and price quotes we had finally picked one to order! Within a few months we had our very own Dog Mascot! As soon as the mascot came in we knew he needed a cape. Nightmare Graphics of Columbia generously helped us design a custom cape and donated their time and materials to the foundation! We are so happy with the way our super hero dog has turned out! Now the fun and we need YOUR help, every super hero mascot needs a really fun and cool name. So we are reaching out to you to help! We would love for your families (children included) to brainstorm some really fun names for our mascot and submit them to us by Friday, May 28th. Our team will vote on every name submitted and choose a winner. The winner will receive a prize pack from the NCB Team! Please work with your family and children and help us name our new team member! Name entries can be submitted to GoOutBeGreat@gmail.com or by commenting on this blog post or on our facebook page! Please join us in welcoming …. “Our mascot with out a name” to the Nathan Chris Baker Foundation Team! Of course, his first stop had to be at the Mechanicsville Playground! 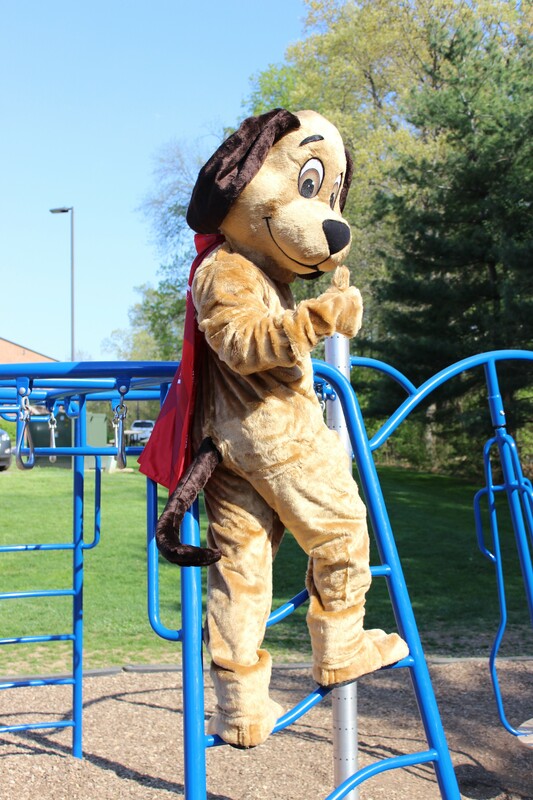 This week we snuck over with our mascot to the Mechanicsville Elementary School playground where the entire Nathan Chris Baker Foundation story truly began. We thought we’d sneak in to capture a few pics of the mascot playing and no one would see us! Little did we know we’d be busted by the Girls On The Run! It made our day to see how happy they were, to even see one young lady wearing a Go Out Be Great shirt, and see them giggling and excited to meet our “Super Dog” (that needs a really cool name) and were happy to pose for a picture! Thank you girls for making us smile! Go Out. Be Great. Good luck coming up with names! Please submit your name ideas to GoOutBeGreat@gmail.com or by commenting here on our blog or on our facebook page! Also please share this post with your friends to help name him too!!! The Nationwide Insurance commercial during SB 49 really had people talking, Tweeting, and Face-Booking. I found that most people reacted negatively to the commercial. I missed the commercial. I was catching up on the sleep I missed the night before and had to have a quick nap during the game! Katie and Drew saw it and she watched as Drew stared at the TV. “Ok.” That is it………”ok”. I don’t think Katie and I can comprehend what goes through Drew’s mind, mostly because he is smarter than the two of us combined. Another part of it is that he doesn’t share those thoughts with us. Not for a lack of trying…….he just doesn’t open that part of himself to us yet. “Ok.” and he was back to the game. I am sure that a million thoughts ran through his mind at that moment. Maybe someday we will know. On the night that Nate died, Katie and I entered the bedroom where Drew had been huddled for some time. His mind distracted by relatives, movies, and video games. I remember sitting with Drew on the bed and telling him that we needed to talk with him. We knew that this was not going to be easy but I also know that this type of news is not a time when suggestive words will do. “Passed away” “No longer with us” and “In a better place” are things we say to tiptoe around death. They leave people with hope that the ending to the story may not be final. We knew that Drew was smart enough to know what was happening during the previous few hours and knew that this was something that needed to be done. We told him that we needed to talk and that we needed him to listen. Drew stared at us and we told him that Nathan died. That 7 year old boy looked back at us and said “So Nate is dead?” Yeah buddy…….Nate died. His response……”Ok”. That was it. It was almost as if he clicked the switch and went into emotional protective mode. I’m not sure what we expected from a 7 year old. I believe that kids only process as much as their minds will let them. In time they begin to process it more and more. I have worried since that time that Drew may have fears of the “What if”. What if something happens to me? What if something happens to Dad and Mom? What if? The hard part is that we can’t honestly promise him that something won’t. I had previously made that promise to Drew and Nate and I can’t do that again. I recently had a talk with Drew about death and the “what if?” I explained to him that things in life happen but what happened to Nate is not typical. I told him that typically – Parents live a long life and eventually die. I told him that kids typically live longer than their parents and get old before they die. Sounds kind of deep for a 9 year old to digest but Drew has been through a lot and thinks about everything. I want to put his mind at ease without promising him that tragedy won’t ever happen again. After talking with Katie about the Nationwide commercial and hearing others talk about it………..I decided to watch it myself. We can debate a lot of things about the commercial. Timing – was it appropriate for the SB? Intent – was the intent to bring awareness to household accidents or sell insurance? Effectiveness – did it have the effect that Nationwide expected? I have a few thoughts on those topics but I want to talk about the commercial first. A boy (5 years old or so) doesn’t get to fulfill the things in life that every kid should because his life is cut short by a household accident. I struggled with these very thoughts after Nathan died. I remember thinking – I never took him to Disney. I never took him on a plane. The list was longer than I can even begin to imagine but I remember struggling with the things that Nate never got to do because of this tragedy. So those – “Things he will never get to do.” Those are real. I also know that what happened to Nate was a horrible tragedy. One that I would do anything in this world to change. No doubt, we would give up this great foundation and all the work that it has done. No doubt, I would trade places with him if given the option. Obviously those aren’t options. I also know that what happened to Nathan was totally preventable. That is hard. Really, really hard. In 2013, I attended some leadership training for work. Sometime during this training we were broken into small groups (6-8 people) and given a scenario. The instructor told us that each group would be given a title and have to respond to the scenario as if they were part of that specific group. I don’t remember specifically what the groups were but they were something like this (Fire Department, Park Service, Police Department, Health Department, Media). I was in the media group with several other counterparts. One of the members of my group happens to work with me on a daily basis. I had never met the other people in the group prior to this training. The instructor then provided us with the scenario – A family arrives at a local park and walks to the area near a waterfall. The area where the family is located is at the top of the falls and the overlook is marked by only a sign alerting people to the threat of the waterfall. The family approaches the waterfall and the 3 year old child walks over and falls over the edge and drowns. The instructor then gives us several minutes to talk among our group at how the “media” would respond to this. I immediately felt the others in the room that I work with on a daily basis looking in my direction. I could see the horror on their faces. I could tell that they wanted to see how I would react and how this would affect me. I knew that they probably just wanted to ask me if I was ok or ask the instructor for a different scenario. The guy in my group that I work with looked over at me and whispered – “You ok?” I nodded and sat quietly. I listened as others in the group discussed the scenario. I listened as some in the group criticized the parents for allowing such a horrible tragedy to occur. I sat there with a Go Out. Be Great polo on and pondered how or if I should respond. I wondered if any of them had previously noticed my shirt and Googled the NCB Foundation. In the end – I decided to sit quietly. I thought about this scenario all night and how I responded or my lack there of. Should I have said something to those insensitive few that were spewing hate for those parents? In essence – that hate was aimed at me. I tell myself often that people don’t know your story. They haven’t been in my shoes. Fortunately! I can’t hold this against them. I can’t criticize them for not knowing my situation. Had I told them my story – I am sure that none of them would have responded they way they did. In all honesty, most would have offered their condolences and had a bit of compassion for me – at least to my face. I have read that Nationwide had high level discussions on this commercial prior to deciding to move forward with it. I am not sure any of the folks in that room have lost a child but I can’t judge their intent without knowing their story. I don’t believe that Nationwide was trying to sell insurance. No amount of money would repair the pain that comes with the loss of your son or daughter. Nationwide knows this. Besides – childhood death doesn’t sell insurance. If anything – the commercial turned more people away than it drew in. Was the timing appropriate? I am not sure that there is ever a good time to talk about the death of a child. Do I wish my son didn’t have to see it? Sure…….unfortunately – death is a part of life. It is the only thing that is a sure thing in our lives. Estimates have 112 million people watching the SB on Sunday night. No other broadcast is more watched. Even if half of those that watched the SB saw the Nationwide commercial – that is a big number. So if there is no good time to talk about the death of a child……..why not now? Why not with such a large audience? The CDC reports “Unintentional Deaths” which encompass car accidents, drownings, and other related child deaths through age 14. The CDC reported 1,156 Unintentional Deaths in 2013. Even if one person saw the commercial and took one step to prevent a death…….that is a statistic that we cannot quantify. One child saved is one family that would not have to endure the horror of losing a child. One child saved is a brother or sister that doesn’t have to imagine life without their sibling. A brother or sister that doesn’t have to contemplate the “What ifs” of this world. Totally worth it! We live in an unpredictable world. A world shown to us through the media as filled with tragedy and grief. In reality, we live in a world where most people have great compassion for others. A world full of people ready to do anything for others. I know this first hand – I have experienced it. When I hear people say “Why do bad things always happen to good people?” I think to myself – bad things happen to all people. There are just more good ones than bad. The odds are against us. I don’t fault Nationwide for running this commercial. Death is just a part of life that no ones likes to think about, but we will all one day be forced to face. Just live it! Live it to the fullest! Wow, when we begin to look back at all that The Nathan Chris Baker Foundation has done in 2014 we are overwhelmed with emotion as we think of the smiles we helped create and especially gratitude to each of you for making it all possible by supporting foundation. Since September of 2012, we have given over $110,000 to school playground construction and back into the local communities. Many people ask us – “What do you all do with the money and where does it go?” So, we thought we’d tell you all about the last year! As a board, we started off our year by meeting as a team in January where we brainstormed and planned for the year ahead. The first annual Golf Tournament was scheduled for May and we formed a new committee called “Days of Greatness” at that board meeting. These meetings are always inspiring for us as a board and team to come together to review the past and the future as the foundation moves forward! In February this year we received our US Trademark approval for our “Go Out. Be Great” phrase and later with much anticipation we also received our official 501(c)3 non-profit status from the IRS, that was effective as of November 2012! The golf tournament turned out to be a huge success with over 120 golfers coming out to enjoy the beautiful weather and have some fun in memory of Nate. While there was no hole-in -one to win the new Chevy truck, many prizes were given out at the banquet over some very delicious food. Planning has begun for 2015, the 2nd Annual NCB Tournament will be held at Turf Valley on Friday, May 29, 2015! Spring and summer remained just as busy with a night out at Chick-fil-A, a rock concert in June given by the JoeyDCares Rock Orchestra, and the opening of the Sandymount Elementary School playground in August. The Chick-fil-A night was a great opportunity to raise awareness of the Foundation’s efforts in the community. We were able to sell merchandise and meet more of you that support the Foundation during our evening at the Eldersburg Chic-fil-A! The JoeyDCares Orchestra Rock concert was attended by hundreds that came out to see their 38 people playing musical instruments and singing all different kinds of pop, rock and jazz music that the audience loved. We also welcomed a partnership with A La Mode Boutique in Sykesville MD this spring to sell our Go Out. Be Great. merchandise. A La Mode generously donates back 100% of all the Foundation’s merchandise sales! This year, for the first time, we walked in the Winfield parade in July with our board and a few supporters all dressed in Go Out. Be Great. gear! They braved the rain to pass out candy, GOBG bracelets, and GOBG tattoos to those in the crowds. This was a fun way to just be involved in the community and we thoroughly enjoyed it! Look for us there in 2015! 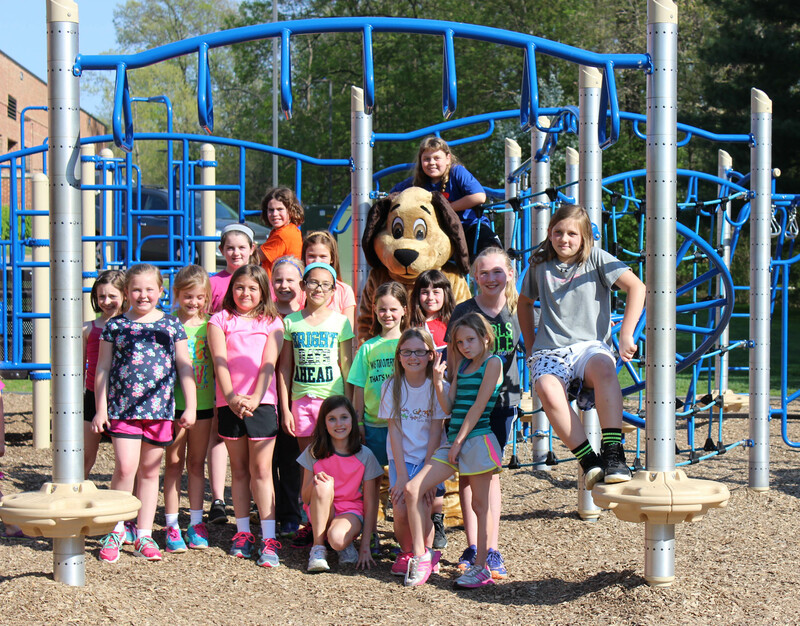 The Foundation’s main project in 2014 was to help Sandymount Elementary School in Finksburg, MD fund their new playground which costs over $80,000! 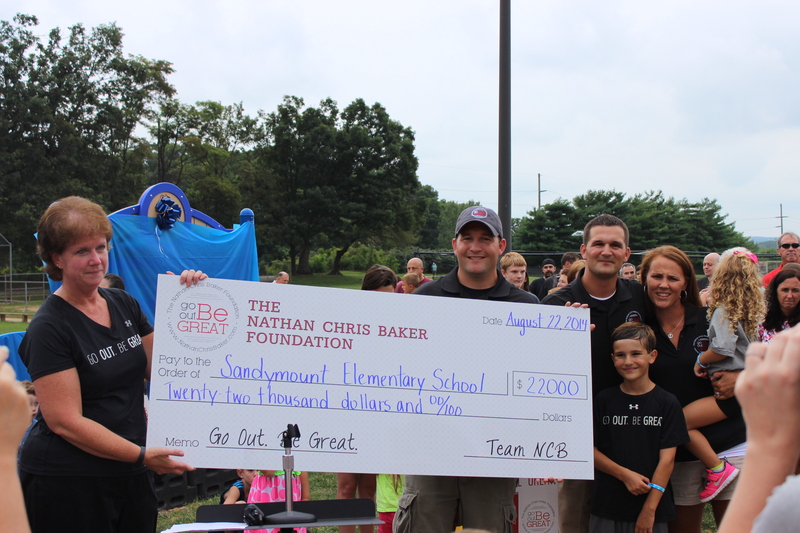 The Nathan Chris Baker Foundation was overjoyed to be able to donate $22,000 to their playground project! In August, we attended the Sandymount playgrounds grand opening and presented them with a check for our donation! Another new playground for children to enjoy! So GREAT! In the fall we held our 3rd Annual Nathan Chris Baker Fun Day at Hoppers with over 1000 kids and adults in attendance to remember Nate and have some fun with their family. 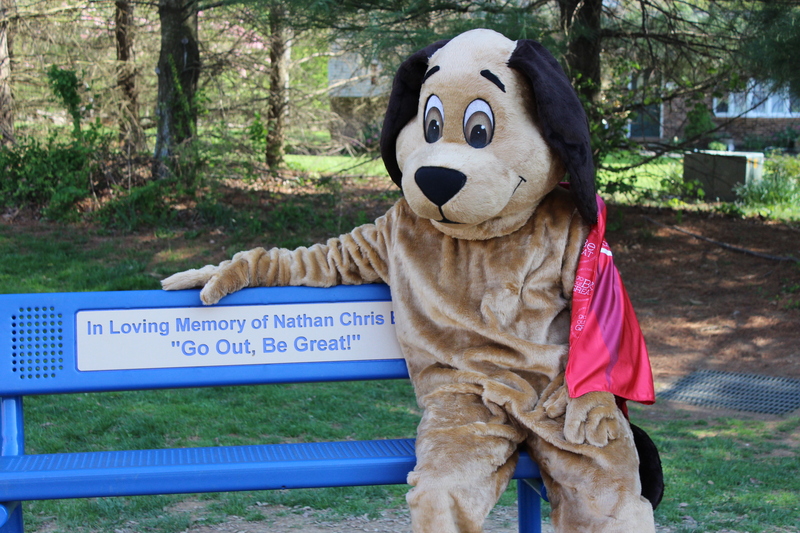 The original Fun Day was started only 2 months after Nate’s death to raise money for Mechanicsville Elementary School’s playground and honor Nate and his love for fun and the outdoors. It has stood as the staple event for our foundation’s fund raising and a really special day to all of us who knew Nate and how much he loved to play and laugh with his friends and family. Thank you to each of you that sponsored, donated to the silent auction, helped by volunteering, and for all of you that bring your families to attend! If you’ve never come… you should! It’s a GREAT day! The next weekend we also had a booth at the Sykesville Fall Festival on Main Street in Sykesville. It’s always great to see our community come out, rain or shine, to socialize and shop in Sykesville. Our annual Stacy Hart Photography fundraiser was also in October and another huge success. The Days of Greatness program was designed to help families who have someone struggling with a hardship and/or illness and alleviate that pain away for just one day. We were honored to help two families in 2014 to have a day with their families and forget about their daily struggles and enjoy what makes them happy. We were thrilled to help a 3rd family by providing their Christmas and taking that financial burden off their shoulders so they could spend time with each other and enjoy every moment. The feedback from each family and their friends was incredible on how uplifting it was to their entire family to not have to worry about anything except enjoying the moment with the ones they loved so dearly. We are excited and looking forward to providing many more Days of Greatness in 2015! Throughout the year we also formed teams for many races to raise awareness for the Foundation while inspiring others to Go Out & Be Great. This year alone, we organized teams to run in Annapolis, MD for the Zooma 10k; in Fredericksburg, VA for the Historic Half, 10K, & 5K race; and a huge team run at the Howard County Police Pace 5k in the fall. We also had a Tough-Mudder team run in Richmond VA and a Ragnar Team run from Cumberland MD to Washington DC. These races help inspire many runners to challenge themselves with something new but also raise awareness. We have also helped many individuals and families throughout 2014 with care packages and grants for sports programs. Our final donation of the year was $10,000 to Runnymeade Elementary School in Westminster, MD to help them get started on funding a new playground for 2015. We are looking forward to seeing their hard work over the next year as they bring their playground to fruition. We are very thankful to so many people and businesses in the Carroll and Howard County areas for your unwavering support throughout 2014 that has allowed us to help so many individuals and families in need to Go Out and Be Great. We thank you from the bottom or our hearts for your time, donations, prayers, and overwhelming support at all our events and look forward to an exciting year of helping many individuals, families, and schools in 2015. So Goodbye to an amazing 2014 and we are ready to say Hello to GREAT things in 2015! Keep following our blog and follow the links at the top right of our website to sign up for newsletters and to follow us on Facebook to stay up to date on all the happenings for The Nathan Chris Baker Foundation. Happy New Year from the entire Go Out Be Great Team! What are birthdays like in Heaven? Today is December 23rd, 2014. 8 years ago today you came into this world and brought so much joy to our lives. Drew was just 19 months old but was so proud and honored to be your big brother. Daddy was in love with 2 boys in ways he never knew possible and Mommy’s heart was just overflowing with joy, hope, and love for our family. In the 5 and a half years you spent with us; we were completely in love with every moment with you. Today, we would be celebrating your 8th birthday. It’s so hard for me to imagine you as an 8 year old boy. Would you still love monster trucks, tractors, running outside, and playing in the dirt? Or would you be into sports, bey blades, or building even bigger lego creations? How would you have grown and changed? Would you like your hair short or long? Would you be enjoying school or skipping school like you used to joke you would? Would you be playing baseball, soccer, or wrestling? Which would be your favorite? On December 23rd, 2011 we celebrated your 5th birthday. We took you to the Japanese steak house at your request! I’m not sure you really even liked the food… actually I don’t think you ate much of anything. But you loved going there because of the production. You smiled from ear to ear the entire dinner. You loved to laugh and see others laugh too. This was the big birthday! I remember how excited you were to hold up one whole hand for the yearly birthday picture! 5 whole fingers! In my mind you are always 5. Your 5 year old face will stay etched in my heart forever. You will still cuddle in my lap, have the sweetest smile and laugh, and will forever be my baby boy. Your heart will still flutter against my chest when you are scared and your face will smile from ear to ear when you are headed out to play. You will cuddle your baby sister on the couch and wrestle around the family room with Drew. You will go from sweet to spunky in the blink of an eye. Your 5th birthday is one I will never ever forget. These images of you are some that I will always remember as you at five years old. We pray every night for God to share our love with you. We hope you feel it every day. We cannot see you with our eyes but we can feel your love in our hearts always. We think of you every day. Drew is so proud of you and he is especially proud of Go Out Be Great and all that it means. Drew talks about you often. Sometimes the stories make us laugh and other times we cry. We miss you. He often talks about his memories of you and all that you and he did together as brothers and best friends! You should see him play his guitar Nate! You would love it and be singing along beside him I’m sure… or making up a silly dance to go with the music! Kaylee has lots of questions about you and wants to know all about who you were and where you are. She’s asked to visit heaven so she can play with you. A few weeks she was singing about you. She calls you her “Angel Nate”. She feels a very deep love and connection to you that she is still trying to figure out. You poured so much love into her that she knows you are special! She’s sweet Nate, and she’s awnry too, she’s so much like you. I know that you would just eat her up and you would be taking care of her if you were here. Last week I was finally able to make Drew and Kaylee photo books to put on paper their lives with you. It was really hard to go through all your pictures, all our family events, trips, and just daily life full of pictures. But I know that Drew and Kaylee will each treasure their books and we will be able to talk and share even more stories about you through pictures. Today we celebrate you but we also hurt. My heart feels torn. We miss you Nate. There are many things we just don’t understand but I know there will be a day when every tear is wiped away and we are rejoicing in the streets of heaven together. We don’t understand. Our hearts break. But we will keep being great for our Nate the Great. When you went to heaven a piece of my heart went with you. You are part of me and I will forever make you proud. We always made a point to show you how special you are on your birthday. That will never change. This year I had a hard time deciding what to do to honor you. But then I remembered that we always, always, always honored you on December 23rd and that should never change. We always made sure you had a special day outside of Christmas that felt like it was all yours. Today, we hope to fill the streets of heaven with balloons for your birthday! We invite family, friends, and anyone who is thinking of you to send their balloon to heaven too! What are birthday’s like in heaven… I wish you could tell us. But I hope that you feel all the love is that is being poured out to you today. We love you to the moon and back and back again little man! This has been a very tough fall season for me. I have struggled through the end of summer, back to school, fall activities, watching other families interact, and even fun day planning. The week leading up to fun day I found myself in a complete fog emotionally. I couldn’t focus and my mind was always wandering everywhere but the to do list at hand. I LOVE fun day but I felt distant and couldn’t figure out why. That Friday morning, as I laid in bed trying to drag myself out, I had little footsteps tip toe in and crawl into bed to cuddle. It was, our sweet girl, Kaylee but as I heard those footsteps I was so clearly reminded of Nate’s footsteps. It was as if it was yesterday he was tip toeing around our bed, tapping me as he looked at the clock at my bedside, asking “Is it 7:00 yet?” We had a rule that it had to be 7 before he could get up to play because he was always our early riser, up and ready to tackle the day before the sun. That Friday morning before fun day, I sat and held Kaylee as my eyes welted with tears. This life we live sometimes just isn’t fair. As I began to feel guilty for still laying in bed when I knew I had a bazillion things to do for fun day that day… it dawned on me. My fog, it was me missing Nate. My fog, was knowing that this marvelous great day, was for him. If Nate were still here, there would be no fun day. That’s a tough and very bittersweet feeling. I wished Nate were still here but then felt guilty for that knowing what we’ve been able to do in his honor. Wow, what an emotion to wrestle with. Fun Day is for Nate. It’s the first fundraiser that was created in his name where community came together to not only raise money for a playground but also to show support for our family and pour out love for Nate. Sunday came and Fun Day was another huge SUCCESS! Third year in a row, the day keeps growing in size and in it’s fundraising capabilities. I am overwhelmed that for the 3rd year, we still have overwhelming support from our family, friends, and community that step up to plan, volunteer, and attend. It was at the end of the day while the vendors and fun day team cleaned up that I was brought a bouquet of balloons from the admission table. As soon as I saw our friend bringing the balloons to me, my heart filled with love. I knew what I needed to do. I looked up, and released the balloons straight to Nate. It’s all for you little man. It’s for you. Oh, look at that sun shining through the clouds. If that wasn’t God’s timing… I don’t know what is. It’s a choice to make beauty from our pain. It’s a choice that we make with not only faith but with the support of each other, our families, friends, and this amazing community. It’s a choice to Go Out and Be Great and let Nate live through us. It’s not always easy, actually, I’ll rephrase that…. it’s not easy, but we do it. We do it for love. For love of the foundation, love of our community, love of Christ, and for our love of our sweet Nate. When we feel fatigued, worn down, and ready to quit. Christ’s love for us and our love for Nate keeps us going. We choose to love day in and day out. On the morning of October 4, 2014, I received the news that Bohde had passed. I was, and continue to be, deeply saddened. I immediately thought of his tiny voice when he answered his mom’s cell phone when I called in July to organize Bohde’s Day of Greatness. I thought of his tiny hand as he took mine to help him climb out of the bounce house during his Day of Greatness. And I thought of the great amount of courage he had for such a little boy. The smile he had and the ability to have fun despite the struggles he was facing. The term “surviving” is often used when talking about cancer. In my own life and through my own experience with cancer I have learned that surviving has more to do than with only living or dying. It has to do with whether you let it change who you are or if you allow it to take away your ability to love, smile and to hold onto hope and faith. Bohde was a survivor and it was evident to me and everyone who met him during his Day of Greatness. Bohde wore a shirt with “Stronger than Cancer” written on the front. There is no doubt about it. He was stronger than cancer. He was stronger than cancer ever will be. Though he may no longer be with us in the physical sense, his spirit will be with us forever. Please keep Bohde’s family and friends in your thoughts and prayers.